Winds 20 gusting 38 – not trifling! So Mark Twain is claimed to have said. Of course there are lots of things attributed to Mark Twain – and doubtless many famous people – that they never said, but since Twain was known for the pithy one-liner, we’ll let him have that one. Particularly because it’s true, and will likely stay true – chem-trails and other conspiracies not withstanding. The weather is still out of our control, and seems likely to remain so for my lifetime, at least. 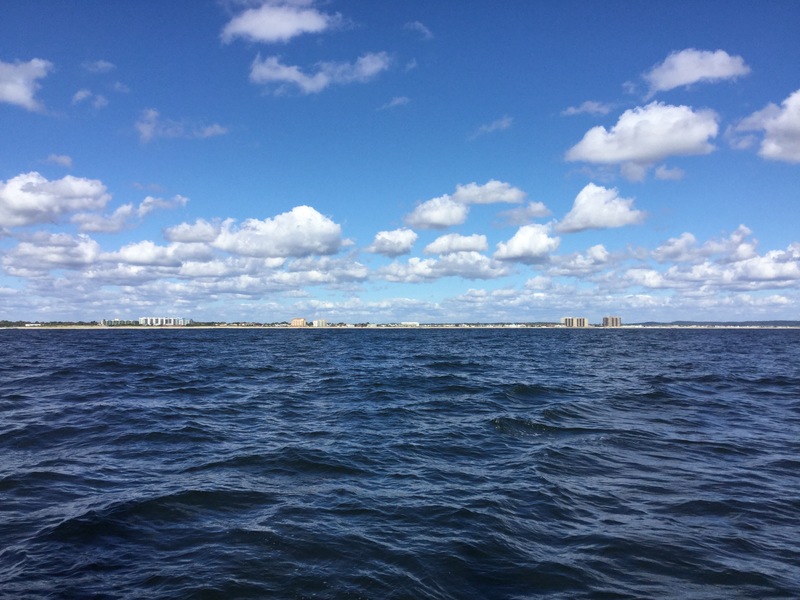 Yesterday Nicki and I left Breakwater Harbor, off Lewes, Delaware at 8am, and headed out around Cape Henlopen for the open Atlantic and a 35 mile jaunt down the coast to Ocean City, Maryland. 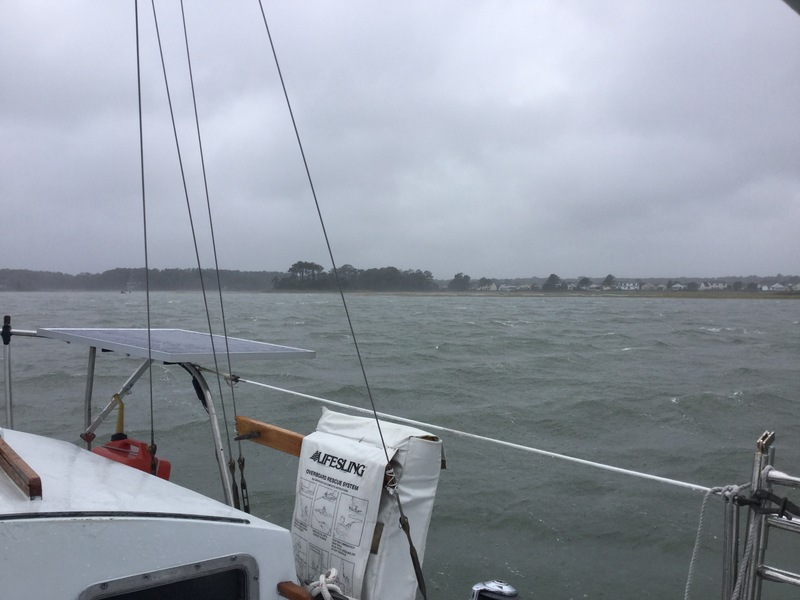 The forecast as we departed was for seas of 2-3 feet and winds peaking at around 15 knots before diminishing in the afternoon to 8-10 knots. From there, the forecast also called for a front to move in and pass, bringing rather more wind for the overnight, so we planned to tuck in to Ocean City behind Assateague Island to wait out that bit of weather before continuing south. But our 8am departure was basically the only part of our day that went completely according to plan. Rather than seas of 2-3 feet, we found 5-6 and occasionally 8 feet, and the wind continued to build slowly throughout the day, gradually being supplemented with rain. 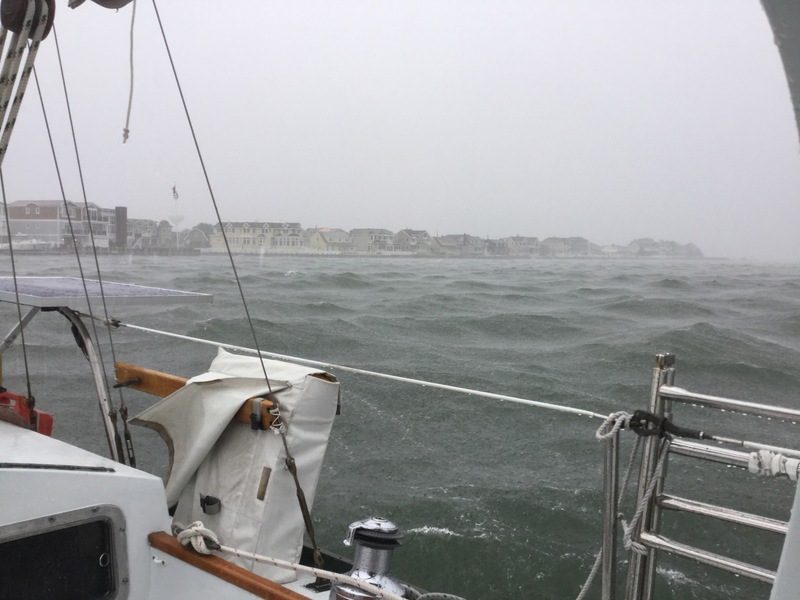 We passed through the inlet at Ocean City about an hour after slack water, and we’re very glad it wasn’t any later, as it was still a rough ride. There’s also an unmarked shoal in the inlet, which we only dodged at the last minute. Just a thrill-a-minute, this cruising thing! 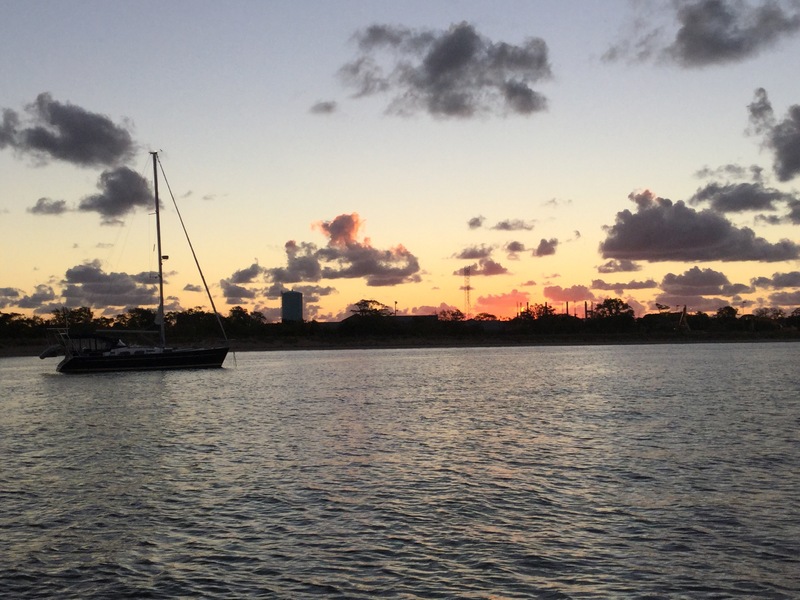 Meanwhile we’re getting notes from other cruising friends who are many days ahead of us in this southward migration, and they’re sending lovely sunset pictures and stories of their more pleasant adventures. We could do with some “more pleasant” any time now, you know? So that’s the state of weather forecasting – which was the whole point of this post, you may recall. Only a forecaster can go to work day after day, get it right less than 50% of the time, and still be considered to be performing adequately. I’m not bitter about that – just saying it’s a funny world. Categories: Cruising, Cruising risk-management, Weather | Permalink. Cruisers eat too, ya’ know! It comes as a surprise to many people that we can actually live like real people, even though we live on a boat. Notice I didn’t say “…like normal people”. You can’t really be what most people consider “normal” and live on a boat. In an age where a 1000 square foot house is considered “tiny” and 2000 square feet is “cozy”, choosing to live in less than 200 square feet – as we do on Sionna – borders on the radical. Or just plain crazy. 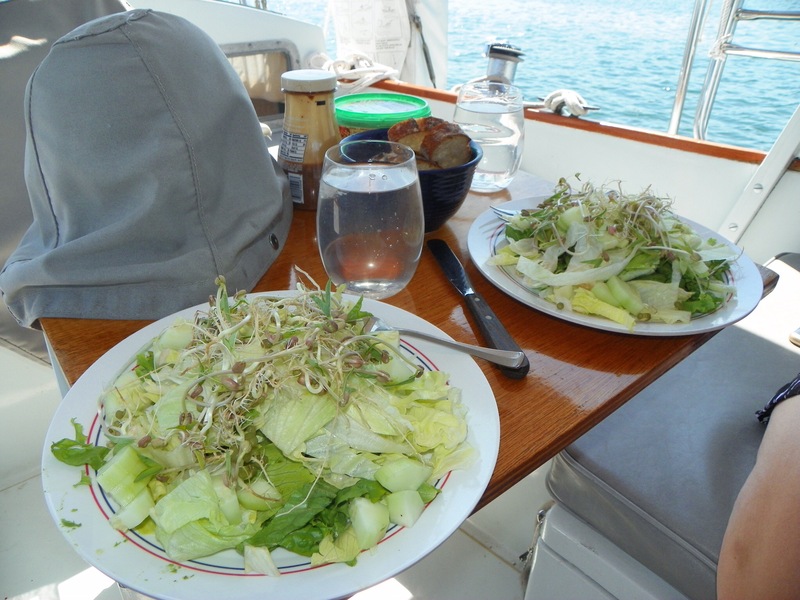 In several conversations we’ve had with perspective cruisers, the subject of provisioning has come up, and many times the assumption going in is that living aboard means doing without fresh food, without produce, without “real” meals. Or at least, it doesn’t HAVE to be true. 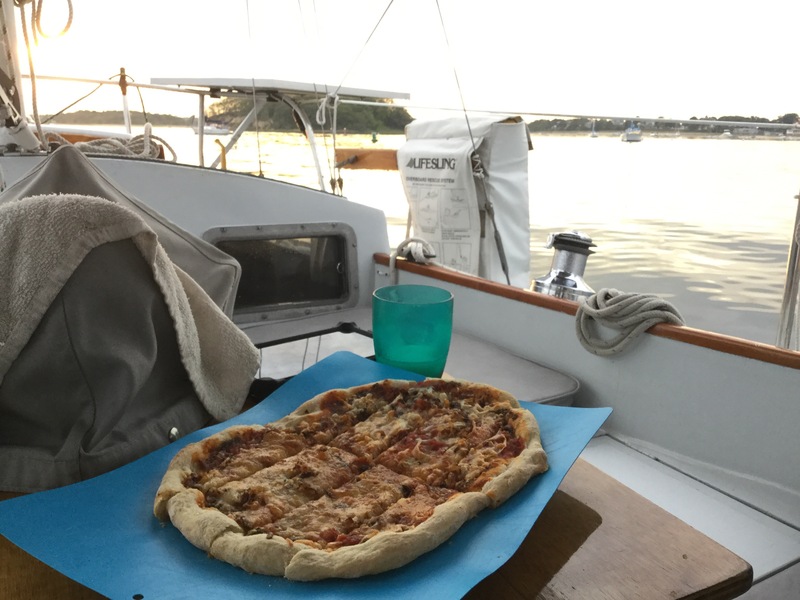 One of our favorite cruising blogs is called “The Boat Galley”, and the author, Carolyn Shearlock, states categorically (though these are my words) “You will eat like you’ve always eaten – don’t think that moving aboard is suddenly going to make you love XYZ if you’ve always hated XYZ in the past”. She’s absolutely right. You have to stock what you like, because you won’t eat what you hate. So you can and should stock and utilize almost anything aboard that you’d expect to have in your land-based home, with one significant caveat: Storage space. 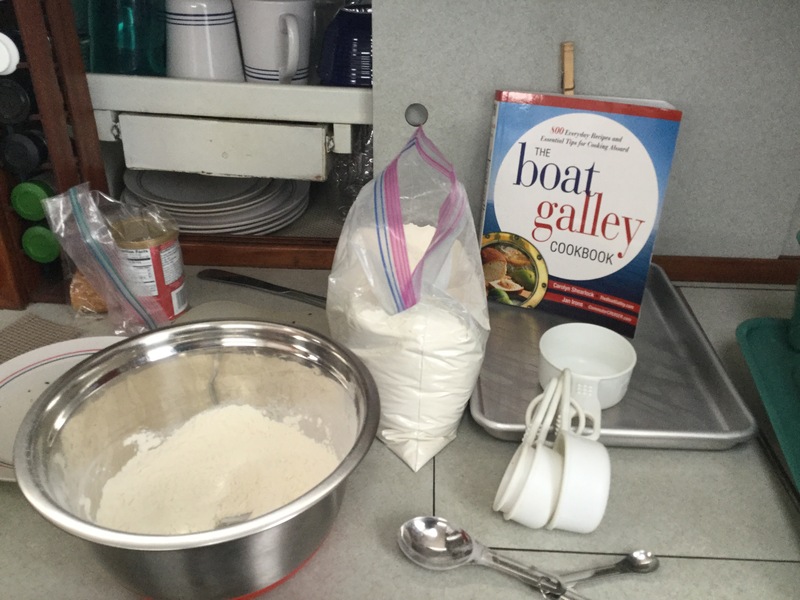 Because on a boat, storage – and particularly cool/cold storage – is severely limited. That 22 Cu/Ft freezer and 25 cu/ft fridge you’ve grown accustomed to? Shrink the whole thing down by a factor of 10, and you’re close. Aboard Sionna, we have a 4 cu/ft fridge, and about .9 cu/ft (yes, less than 1 cubic foot) of freezer space, and we feel rich beyond measure each time we take out two ice cubes each to cool our drinks. We took four cold beers to a friends boat to share the other night, and his exclamation “Hey, they’re cold!” When he reached into the bag could be heard across the bay. 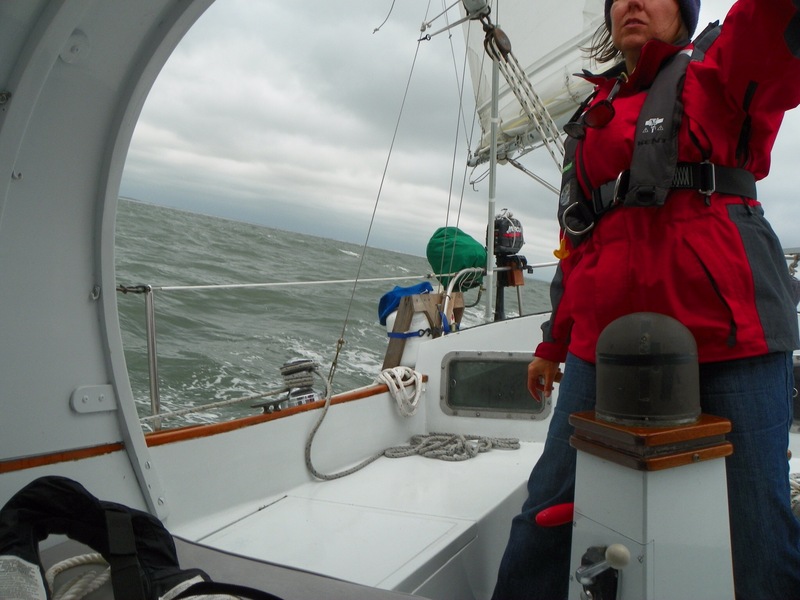 Aboard Sionna we’re beginning to learn what’s possible, and what’s worth the effort. Fresh produce is a non-negotiable. Since my cancer scare back in May, we’ve made a major diet change, and we’re now what I call “Practical Vegans”. We’ve eliminated animal-source proteins from our diets to the extent practical, which means that vegetable sources of fats and proteins are vital to our nutritional balance. Avocados, nuts, seeds, tempeh, whole grains, and of course breads form the base, but the fill includes pretty much any fresh veggie you can name: In addition to fresh bean sprouts nearly every day (I bought and learned to use a small sprouter before we left, and wouldn’t be without one) and salad in any form, brocolli, cauliflower, peppers, onions, carrots, plantains etc. are favorites. And once we get farther south we’ll happily begin experimenting with whatever local produce and seafood we can find. Biscuits – fresh from the oven! We’ve also eliminated dairy almost completely. The exception is a bit of half-and-half in our morning cup of coffee. Like I said, we’re practical Vegans – and not having a touch of cream in my coffee is just not happening. But I no longer miss butter on my biscuits (or only a little! ), and though the name of this blog is a reference to needing to keep butter cool, Sionna no longer has the stuff aboard. What she does have is a rather impressive selection of extra-vigil olive oils which – thankfully – don’t have to be kept cold! 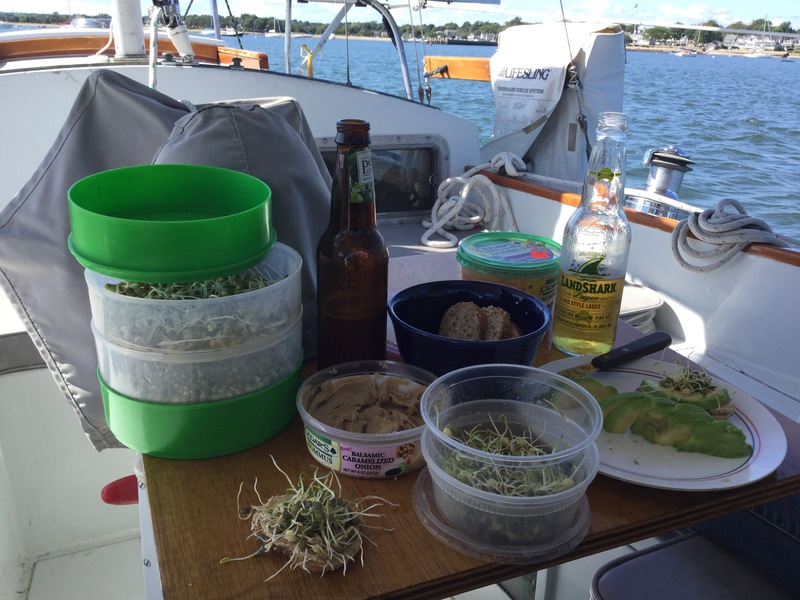 Home grown sprouts – heaven on Hummas! But the cans? Very few. Canned beans, yes. Those are much easier to deal with than dry beans (which we do have), and take a lot less propane (and create a lot less heat in the cabin) to cook, so they get the nod. I also canned 6 jars of pasta sauce before we left Maine, which we’ve yet to use, and we have a few canned vegetables in the bilge which we plan to experiment with over the next few weeks. 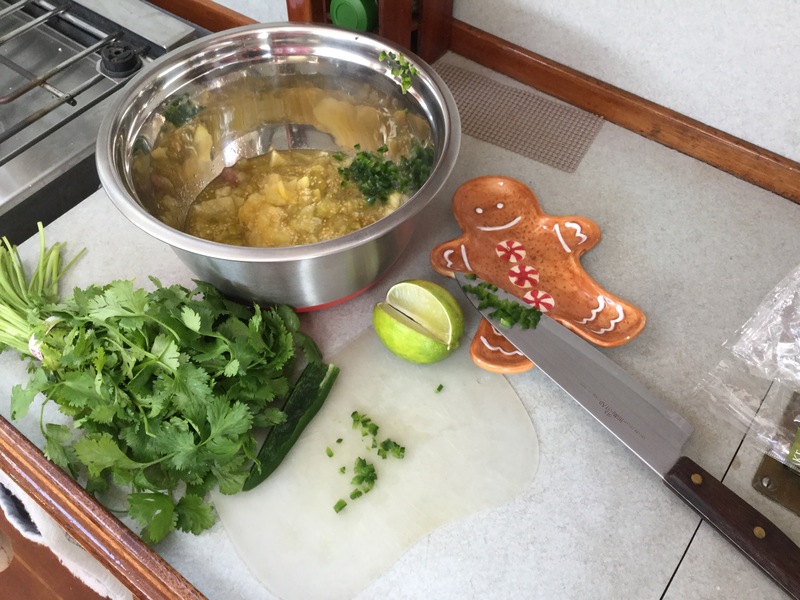 In general, though, our preference for fresh, real food is so strong that we’re unlikely to ever go the canned veggie route except in extreme circumstances – i.e. imminent starvation. We have canned food aboard for emergencies, rather than for regular usage. But please don’t ask me about the three containers of chocolate syrup in the bilge, ok? – I have no idea how that happened. I wrote this post the day after we made the transit from Long Island through New York City’s East River, and down to Sandy Hook, NJ. That was nearly two weeks ago, but it seems I never posted it – as pointed out by a friend of ours. Thanks Matt!So here it is. Not that I’m suggesting that one should necessarily “escape” from New York City, but I will admit that I am NOT an urban dweller. A big city, to me, is Rockland, Maine – population 8000 in the winter, 28,000 in the summer. That’s as big as I can handle comfortably. So naturally I approached the passage from the Long Island Sound to New York Harbor with some trepidation. I mean, that’s a BIG CITY no matter how you slice it! 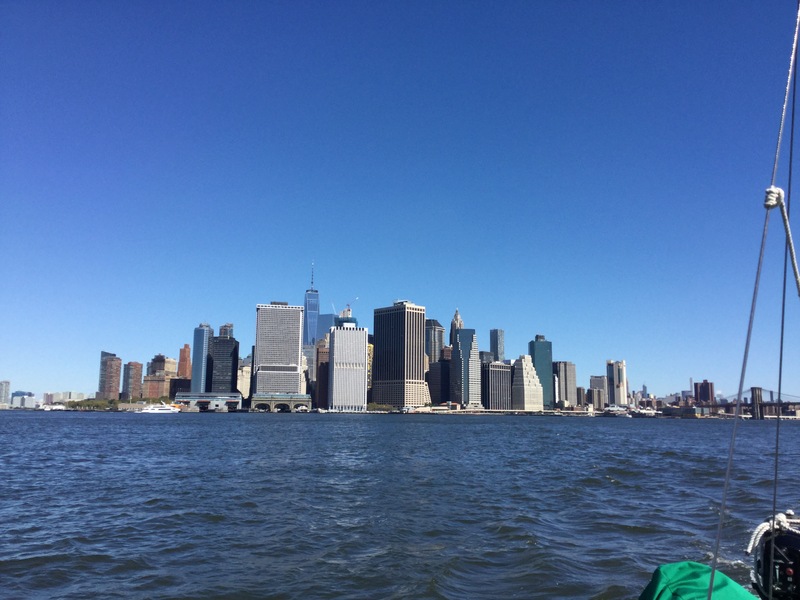 And for those that don’t know about such things, yes, you CAN take a boat from the Long Island Sound into the Hudson River and thence, the Atlantic Ocean without going all the way around Long Island. You just have to be ready for some serious currents and some even more serious boat traffic. In retrospect I think we’d both agree that it was “no big deal”. Yes, you need to time the current correctly. 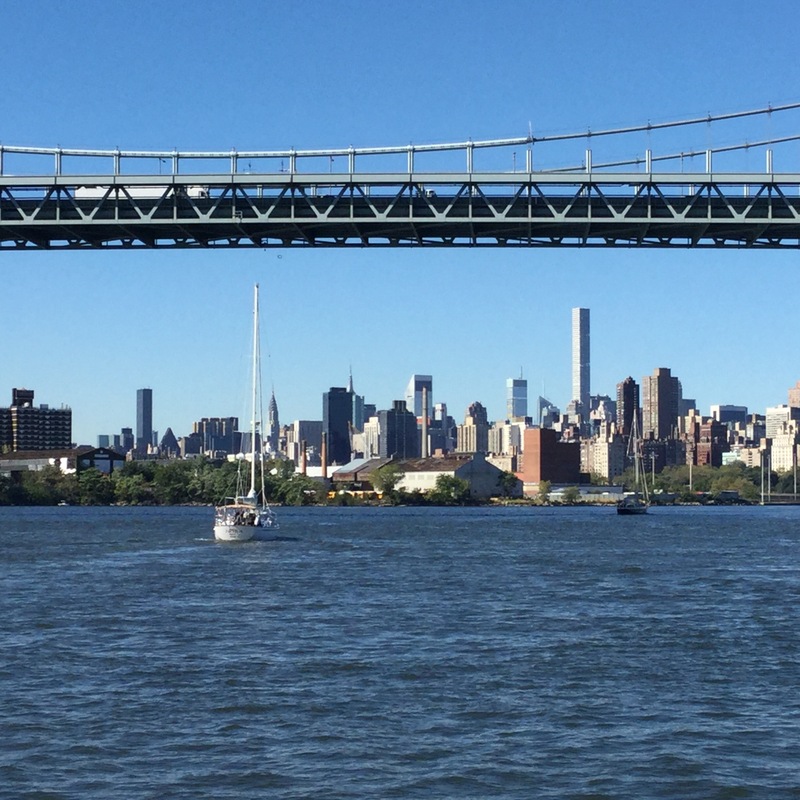 The change in tides between the Atlantic Ocean and Long Island Sound means that a HUGE amount of water is moving either northeast or southwest through Hell Gate, and currents can exceed 5 knots at peak times. Given that 5 knots is Sionna’s maximum practical speed under power, trying to go the “wrong” way is only going to waste a lot of fuel – current is always King. Or Queen. Anyway, you can’t go if the current isn’t favorable. You just can’t. Doesn’t matter if you have a dentist appointment that it took you a year to get and you simply MUST make it to Manhattan against the current – you are not. 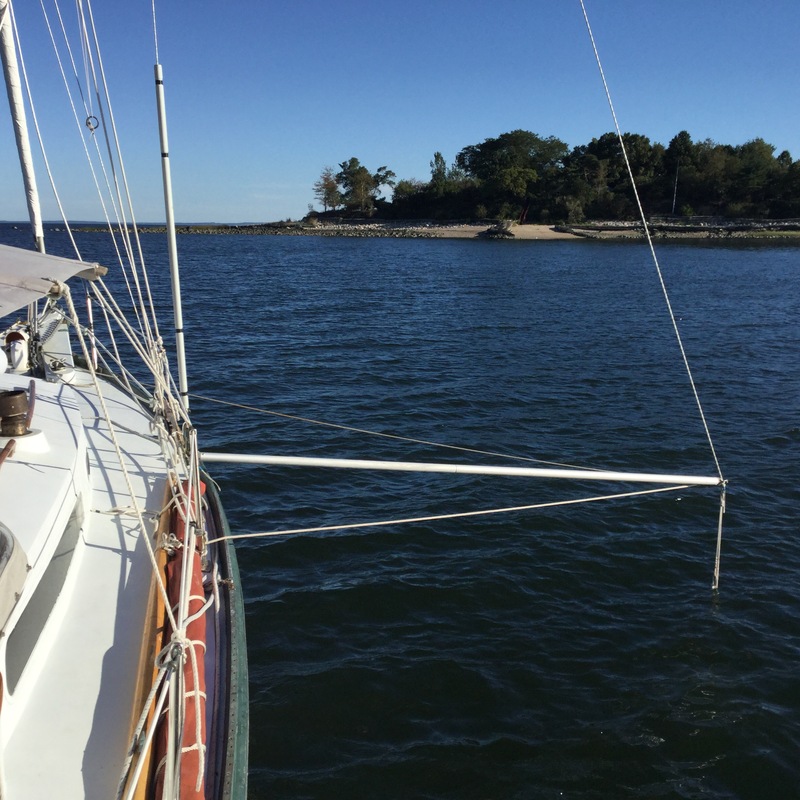 We left our mooring in Manhasset Bay promptly at 7:30am, allowing 2 hours to get to the Throgs Neck Bridge at the forecast slack (zero) current time of 9:30. I’m one of those people who is paranoid about being late, so of course I build in extra time for important arrivals. 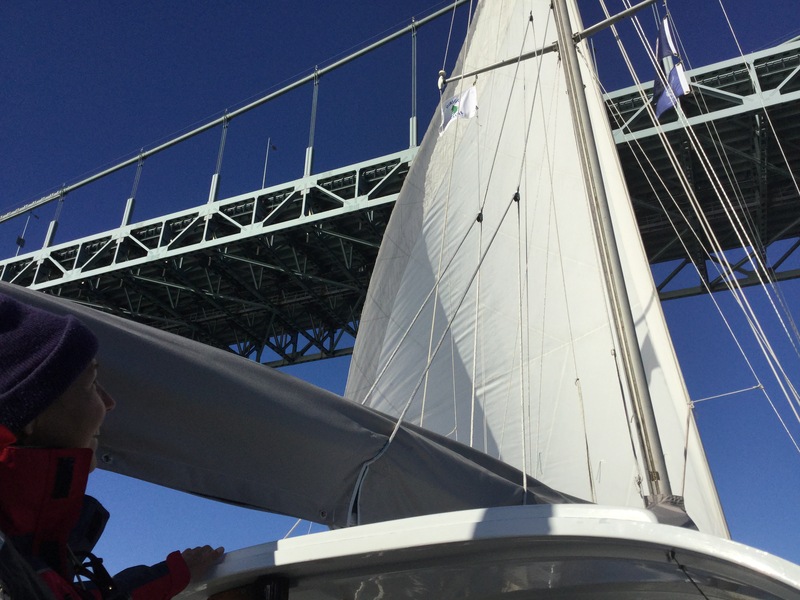 Which predictably got us to the Throgs Neck 45 minutes early, and gave us a quarter-knot of current against us for the first bridge. 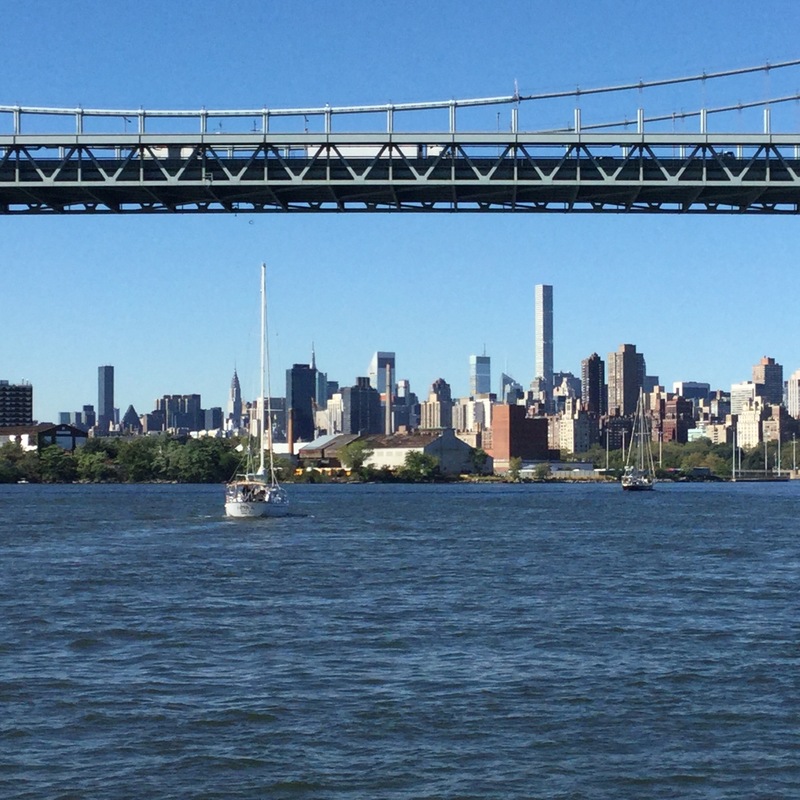 First bridge – Throgs Neck! By the way, we weren’t alone. 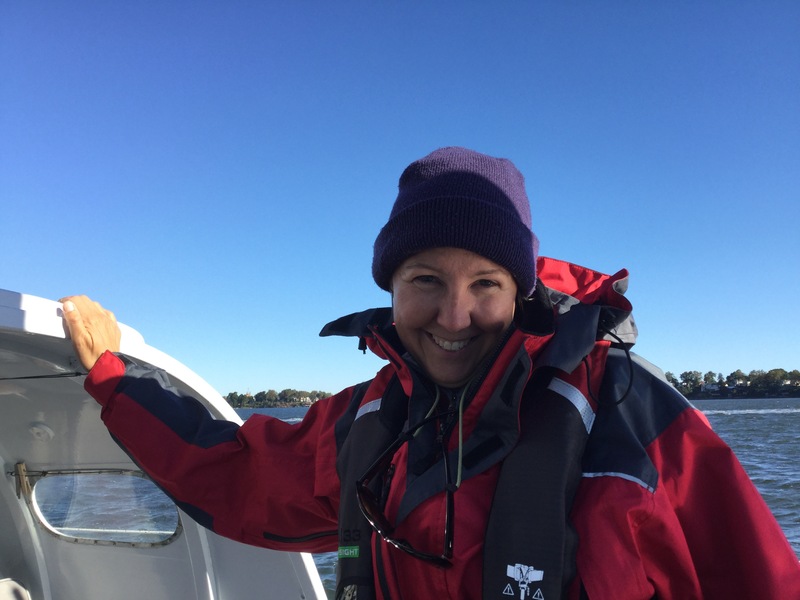 There were at least 5 other sailboats in Manhasset Bay with us, and though we were the first boat off the mooring, those other five – who have more money for diesel fuel than we do – caught up with us shortly before we passed Rikers Island, and we ended up the last in line for the trip south. Last in line again, as the other boats pass us by. From Rikers Island, the next feature is Hell Gate. It’s not as bad as it sounds, actually, though in an under-powered or pure sailing vessel it must have been very interesting indeed! 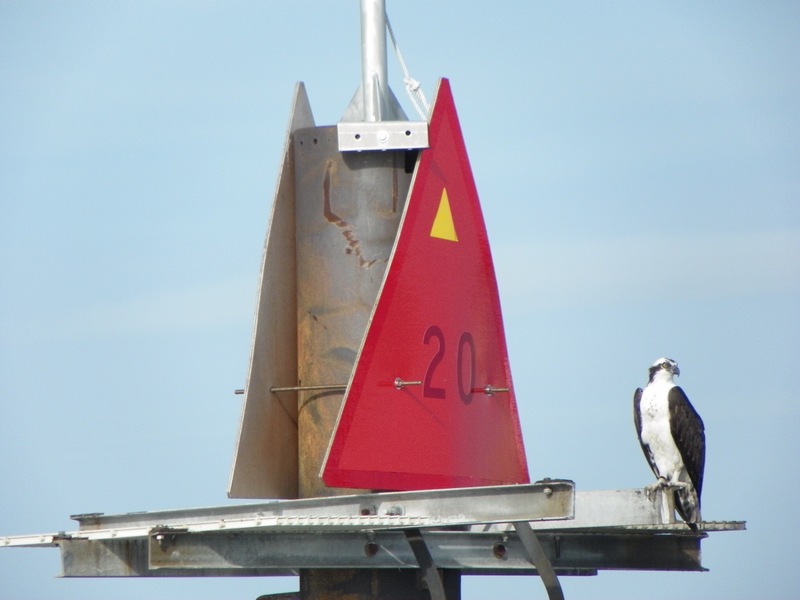 For us, it was just “watch the channel markers” and keep her in between the navigational beacons. No big deal. Except the tankers. Did I mention the tankers? They’re very big. VERY big. And they cannot stop, they cannot turn, they cannot do ANYTHING except blow their very pretty and loud horns if they’re not sure what you’re doing. Of the six boats going head-to-head with this particular tanker, we were the ONLY boat to contact him on the radio and agree how we would pass. The only one. Silly me, guess I’m just a stickler for standard procedures. The tanker skipper was most cordial and seemed to appreciate our effort. 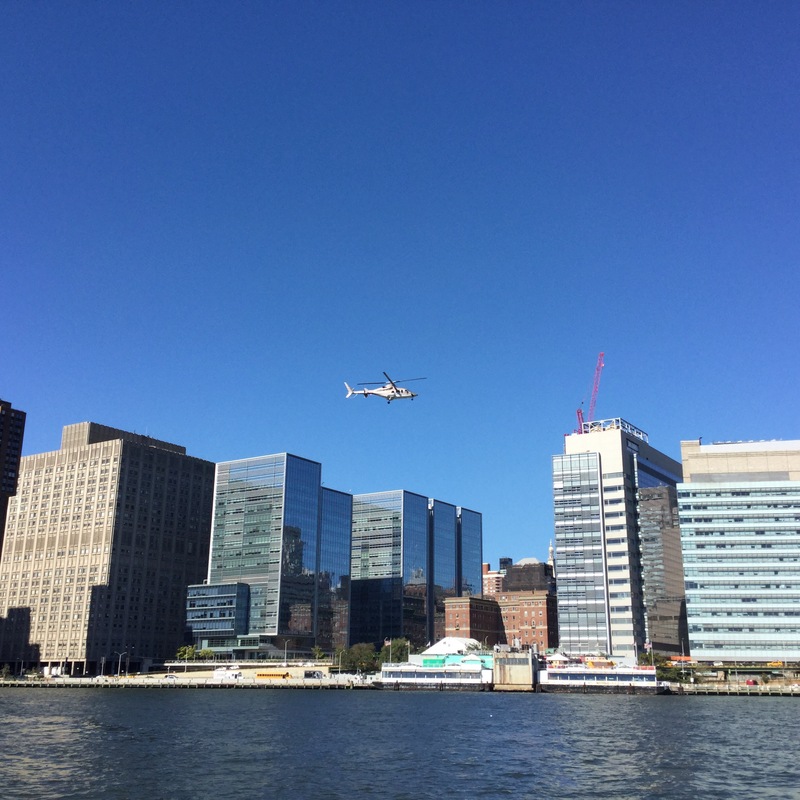 We saw the UN, of course – in fact there were rumors that the whole East River could be closed due to the UN General Assembly going on, but today there were no closures, and we sailed on by in comfort. The only thing identifying the building now is the flag outside, but I remember seeing it from the air, those many years ago when I was a pilot. So I haven’t seen Manhatten since the area around the former World Trade Center was rebuilt. I’d never seen the rebuilt skyline of New York. So tonight we’re in Sandy Hook, New Jersey, anchored of Sandy Hook Point with two of the boats that made the passage south with us. 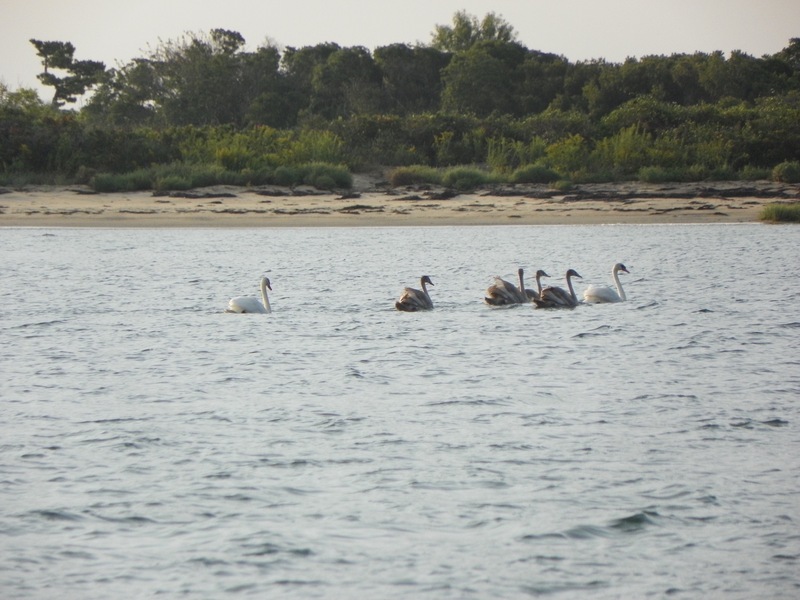 Tomorrow we’ll probably continue south to the Manasquam Inlet – but that’s another story. It’s a lovely beach – or would be, if it weren’t for all the plastic trash that litters every square inch above the high tide line. And if you aren’t already worried and angry about plastic pollution – particularly in the oceans – you need to get that way. You wouldn’t believe how bad it already is. Really, wonderful trip, do it if you can. But stop buying plastic crap, ok? It always becomes a problem for somebody. Categories: Cruising, Cruising risk-management, Environment/pollution | Permalink. 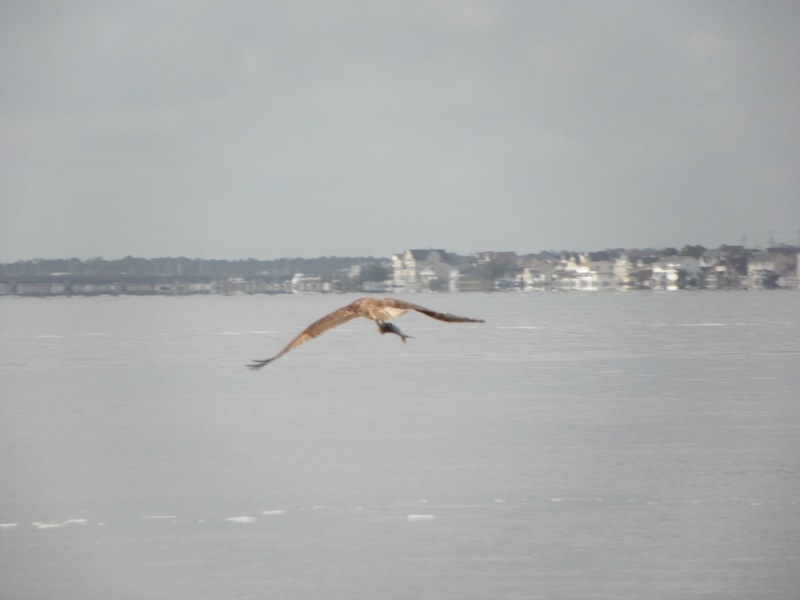 Those are some of the descriptives that come to mind from our last four days, as we’ve made our way down the coast of New Jersey toward Delaware Bay. Beautiful bays, marshes and dunes – and there’s a large, often garish, “what were they thinking” house built on most of them. Or being re-built, as the reconstruction from Hurricane Sandy in 2012 is ongoing. It must be my country childhood/Maine-based eye that sees it all as just “too much” Too many buildings too close together, too many boats (my God there are a lot of boats!) going way too fast. Faster than any reasonable human should want to go. And flat. If you grew up here, you probably don’t notice, but the only thing higher than the houses is cell towers and water towers. And probably that’s what makes it feel vulnerable. There’s no shelter from anything meteorological that might happen, nowhere to run, nowhere to hide. We had intended to move farther south today, but this isn’t what the forecast was calling for, and now we’re glad we were a little slow getting started today – being out in these narrow canals in that wind would have been a mite tricky. Sometimes being lazy is a good thing. Categories: Cruising, Cruising risk-management, ICW, Weather | Permalink. There are many aspects of our travels along the northeast coast which are memorable in a good way: Incredible sunsets, new bird species to identify and marvel at, great holding for our anchor. But perhaps the most memorable thing for us, and the thing we’ve had to learn about by experience, is the currents: The flow of water into and out of this land which is, basically, one big estuary. On Friday the 16th we sailed from Sandy Hook – at the state’s north-eastern tip – south along the coast to the inlet where the Manasquam River empties into the Atlantic Ocean. Now, the Manasquam isn’t very big, as rivers go, and while we’ve read lots of advice about “running an inlet” (as they call going to or from the ocean), and knew in theory to time our transit of the inlet for a slack current, we got there early. That’s what sometimes happens when you make pessimistic estimates as a matter of course – sometimes things go much smoother than you expect, and you actually get somewhere – say the Manasquam inlet – 2 hours earlier than expected, and instead of slack water, there’s a current flowing out against you. But how bad can it be, right? Bad. Worse than bad. Really awful. The books are right – don’t arrive early. The ride through the inlet was horrible, with 6-8’ standing waves that made it feel like we were pointing first straight up, then straight down, and slowed our forward progress from 5 knots to less than 2. It felt like it took forever to clear the ¼-mile long inlet, and being passed by powerboats going 15 knots and leaving a churning, tossing wake behind did NOT make it easier. Really? Passing in an inlet? Please! And no, I’m sorry to say that there are no pictures of the process. I had all three hands and my front teeth on the wheel trying to control a boat, and Nicki was hanging on for dear life and warning me when boats were about to pass us because I didn’t dare try to look behind us myself. But we made it through safely – if not wisely – and we won’t be putting ourselves in that situation again, even if we are early. Inlets, it turns out, really are not to be trifled with. They are memorable in a bad way. But then, I’ve heard swans can be pretty nasty too, pretty as they are. Categories: Cruising, Cruising risk-management, ICW | Permalink. We love our boat. 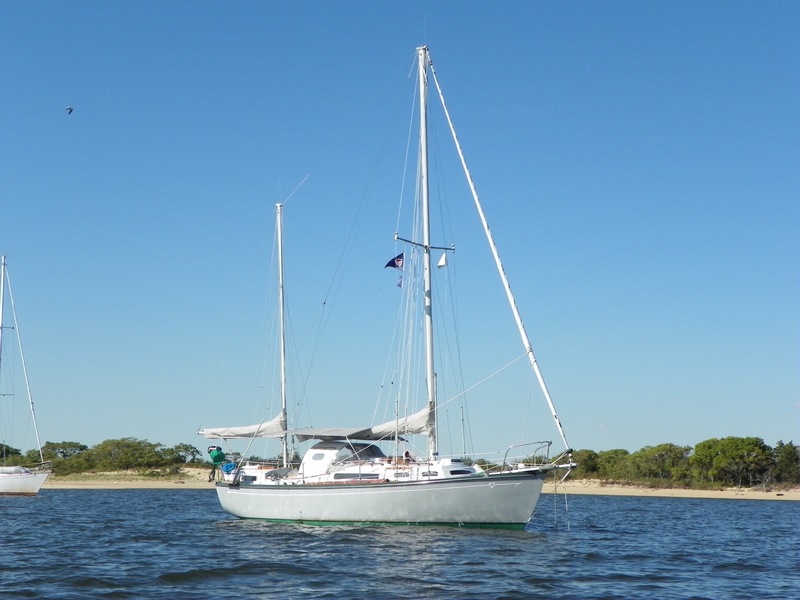 She’s strong, capable, amazingly roomy for her 32 feet, well built and well equipped. Sionna is the perfect boat for us. But she does have one vice. 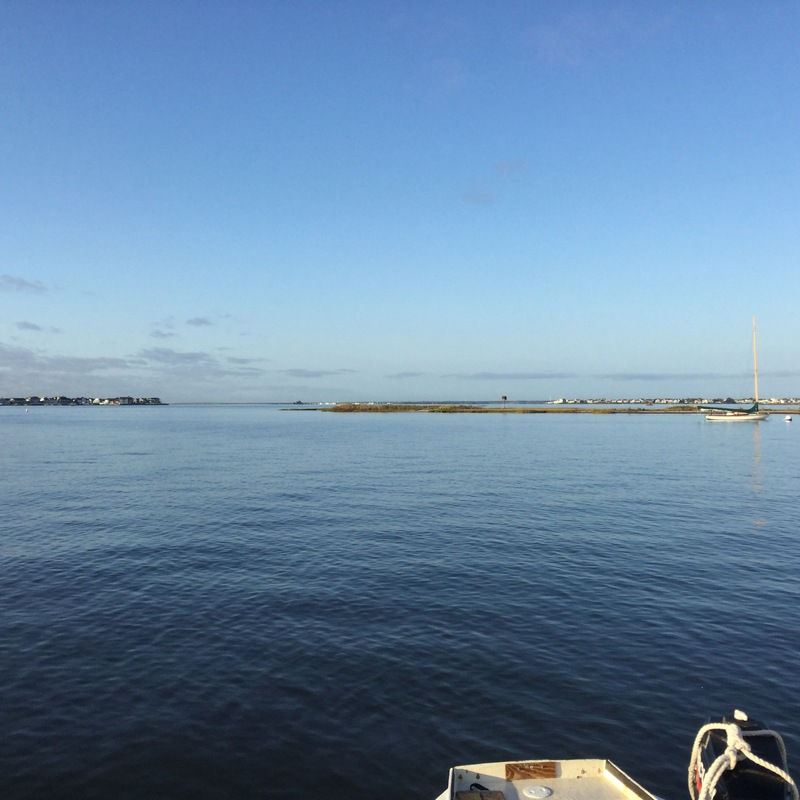 Any time the wake of a boat or a sea comes along at anything close to broadside to our old fat boat, she sets up a motion that’s like riding a round-barreled pony who’s determined to roll in the grass. Baaack and forth, Baaack and forth…. Every boat around us is gently riding to the swell, and Sionna is tossing dishes across the cabin while Nicki and I hold on for dear life. And sleeping? I don’t think so. 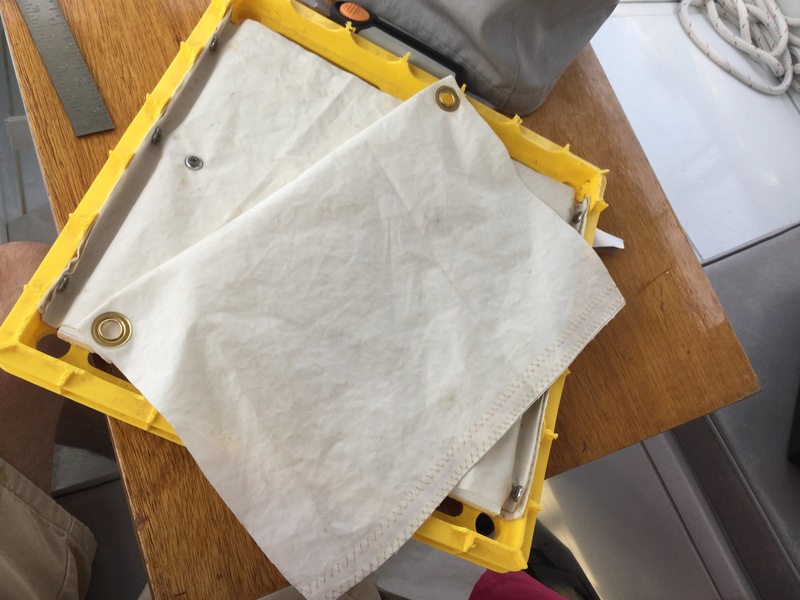 Hence my latest project – creating a “flopper stopper” – a device to catch hold of the water next to the hull and use its weight to reduce and dampen the roll. The idea isn’t new, and it isn’t original. I’ve read several articles over the years about various designs, and a couple of fellow cruisers have shared ideas as well. The one I made is based pretty closely on a recent article in “Good Old Boat” magazine, so here’s a shoutout to a truly excellent publication! Materials are all found items: An old milk crate Nicki’s had since childhood is the base, the fabric is an old sail from the boat we didn’t restore (thank you Renaissance!) the weight was in Sionna’s bilge when we got her, and the line and clips were repurposed from various corners of the boat. 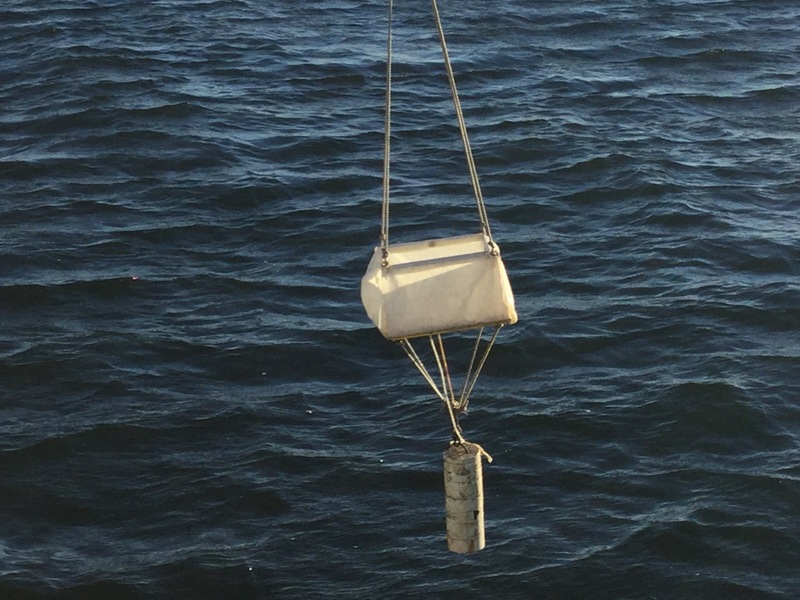 Once deployed, the flopper-stopper is below the waters surface, but it acts like a weighted bucket with a one-way valve in the bottom. Water can come up into the bottom easily, but is slowed significantly in escaping, using the weight of the water to slow the roll of the boat side-to-side. The horizontal pole just holds the unit at a distance from the hull, creating leverage, and the two lower lines keep the whole works out perpendicular to the hull. The support is a halyard from the top of the mast. Does it work? Certainly it helps, but there hasn’t been a huge amount of wake or swell this afternoon to test it. Mostly we seem to be riding up and down on the swells, with only a little roll thrown in. Cautious optimism reigns until proven unfounded! 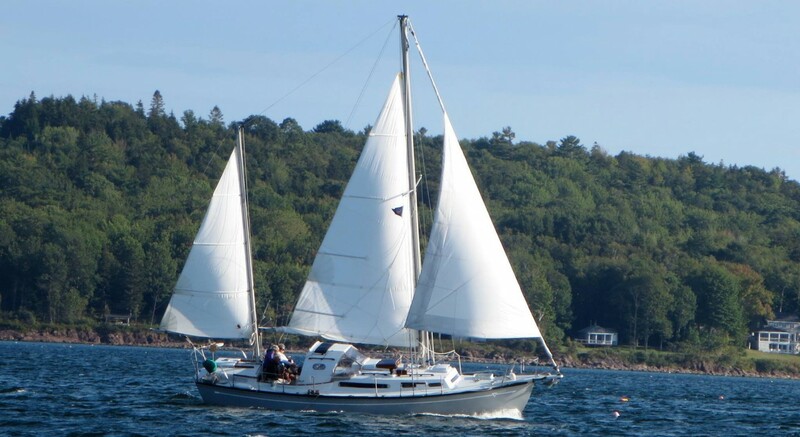 Categories: budget minded, Cruising, Facilities, Inventions, Sailboat | Permalink. That’s a water pump. More precisely, that’s a vane-type raw water pump from a Yanmar 3GM30F marine Diesel engine. But we’ll just call it a water pump. 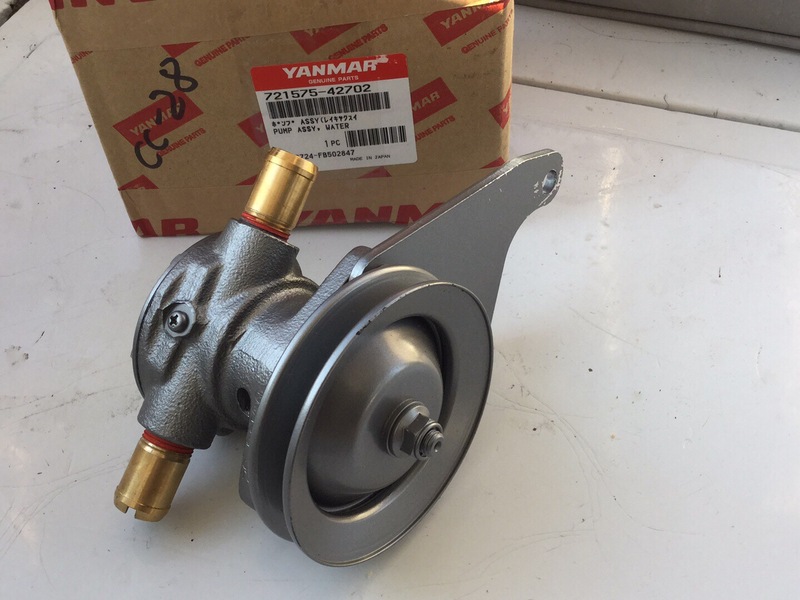 A $511 little piece of gold is another way to describe it, but since the engine won’t work without it, and only Yanmar sells it, you don’t get to consider price in your buying decision. 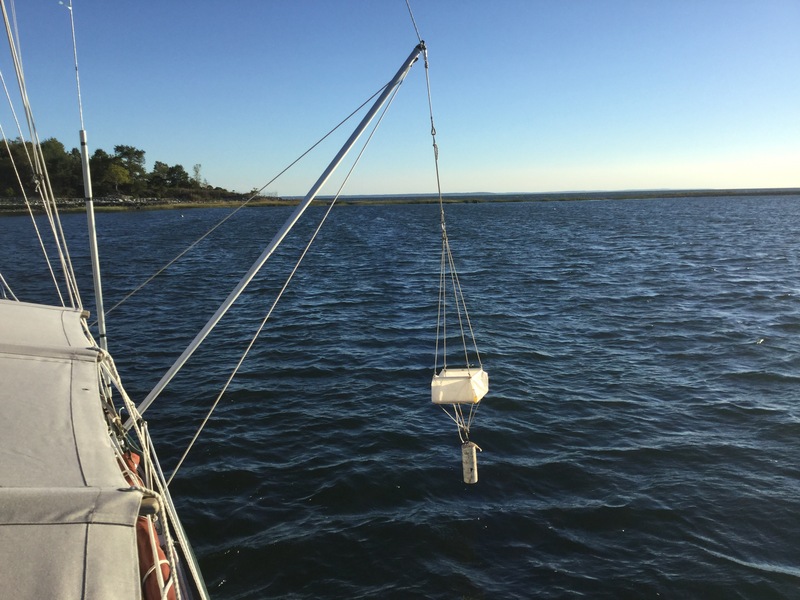 Our old one – probably original 1994 equipment – started dripping a little water about a week ago, and since such things very rarely get better on their own, and since we are very much engine-dependent for much of this trip down the Intracoastal Waterway (ICW), we needed a pump. 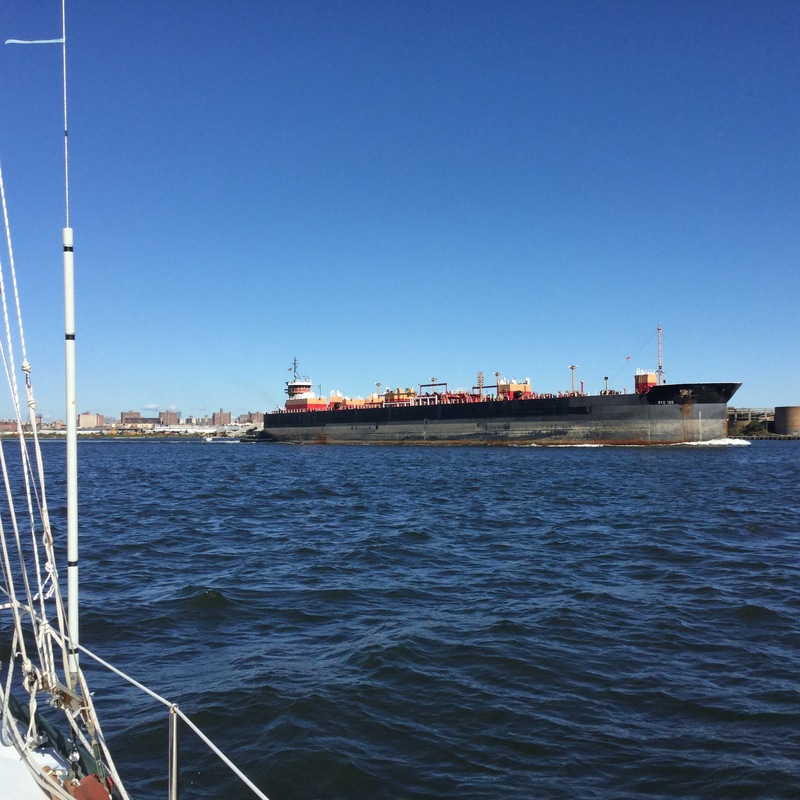 We found a dealer online, ordered the pump shipped to our next port – which was Manhasset Bay on Long Island – and only after the pump was delivered did we discover that it came from our last major port, Pope Island in New Bedford, MA! We were there for four days, and could actually have walked there in five minutes, had we known! Small world syndrome strikes again. But anyway, this brings me to a funny concept amongst cruisers, which is the cruiser definition of what Cruising is. You’ve no doubt seen those funny pictures on Facebook, the ones that have captions like “What my friends think I do”, “What my mother thinks I do”, “What I think I do”, etc? CRUISING CONSISTS OF REPAIRING YOUR BOAT IN EXOTIC LOCALES. Which is, far too frequently, exactly what it is. Except that Port Washington NY is hardly exotic. 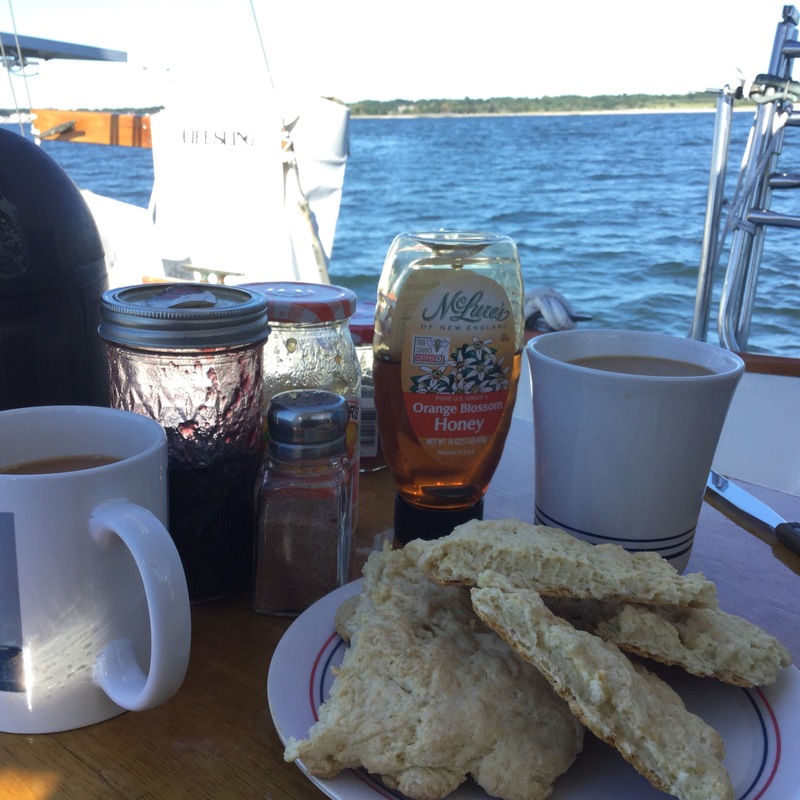 So there they are, the new and the old, side by next… And that’s what my morning was on September 14th, while sitting in exotic Manhasset Bay. 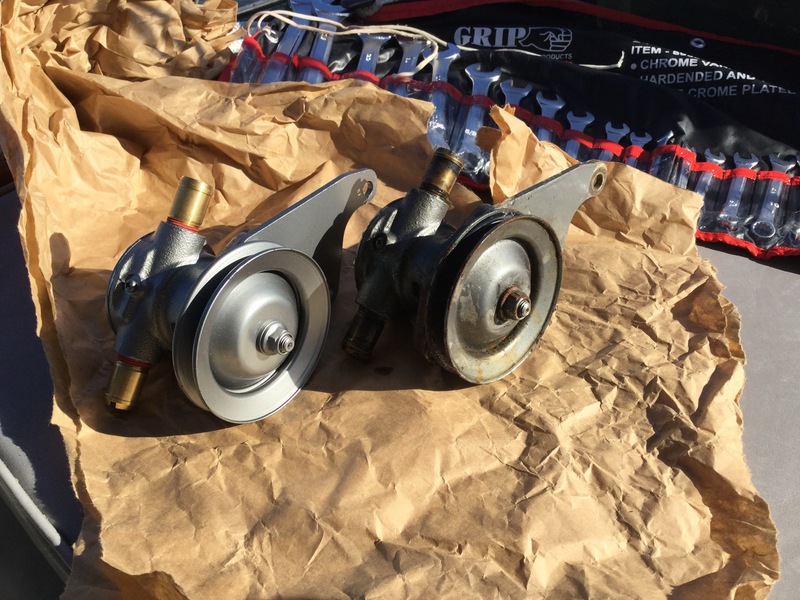 Buried up to my armpits in the rather warm confines of the engine room, replacing water pump and drive belt and succeeding – for the moment – in keeping mechanical entropy at bay. A test run showed perfect function, and for once I completed a task with no significant injury to temper or knuckles. We celebrated with a walk to “Coffeed” for iced coffee and cake – life is good.